Larval dispersal is the key process by which populations of most marine fishes and invertebrates are connected and replenished. Advances in larval tagging and genetics have enhanced our capacity to track larval dispersal, assess scales of population connectivity, and quantify larval exchange among no-take marine reserves and fished areas. Recent studies have found that reserves can be a significant source of recruits for populations up to 40 km away, but the scale and direction of larval connectivity across larger seascapes remain unknown. Here, we apply genetic parentage analysis to investigate larval dispersal patterns for two exploited coral reef groupers (Plectropomus maculatus and Plectropomus leopardus) within and among three clusters of reefs separated by 60–220 km within the Great Barrier Reef Marine Park, Australia. A total of 69 juvenile P. maculatus and 17 juvenile P. leopardus (representing 6% and 9% of the total juveniles sampled, respectively) were genetically assigned to parent individuals on reefs within the study area. We identified both short-distance larval dispersal within regions (200 m to 50 km) and long-distance, multidirectional dispersal of up to ~250 km among regions. Dispersal strength declined significantly with distance, with best-fit dispersal kernels estimating median dispersal distances of ~110 km for P. maculatus and ~190 km for P. leopardus. 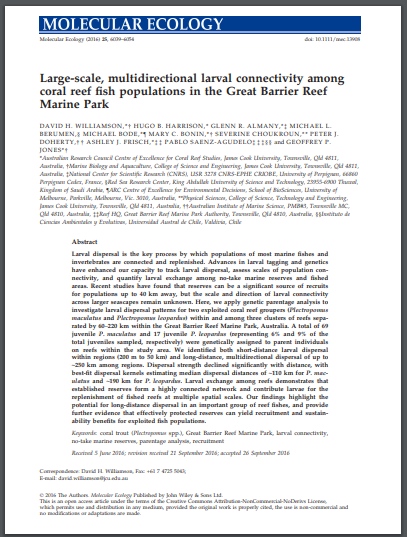 Larval exchange among reefs demonstrates that established reserves form a highly connected network and contribute larvae for the replenishment of fished reefs at multiple spatial scales. Our findings highlight the potential for long-distance dispersal in an important group of reef fishes, and provide further evidence that effectively protected reserves can yield recruitment and sustainability benefits for exploited fish populations.